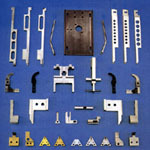 All of our products have been tested and used by Multi-National companies. We supply a wide range of quality AI spare parts (non-common parts as well) for TDK, PANASERT (RHU/RH6/etc), UNIVERSAL (UIC) and DYNAPERT VCD machines. TDK They are total of more than 900 items available. PANASERT They are total of more than 400 items available. UNIVERSAL (UIC) They are total of more than 200 items available. DYNAPERT They are total of more than 240 items available. Please contact us for further assistance if the Part Number is not listed here. Click on Types column below eg.Casio to view model available. CASIO Model 3300 / 7700. Model TCM 41 / 60 / 1000 /3000 / V822 / V1000. Model YM84 / YV100 / 100X / 112 / 51VM11. Rubber Tips (Round, Square & Rectangular). 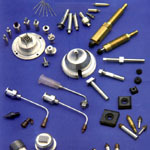 Ejector Needles (Carbide & Steel). 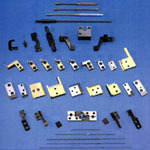 Vespel Tips Collet (SP21 & High Temp Material). 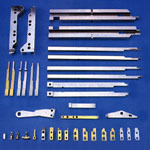 Please provide us your chip size and we will recommend or design the suitable pick-up tools.